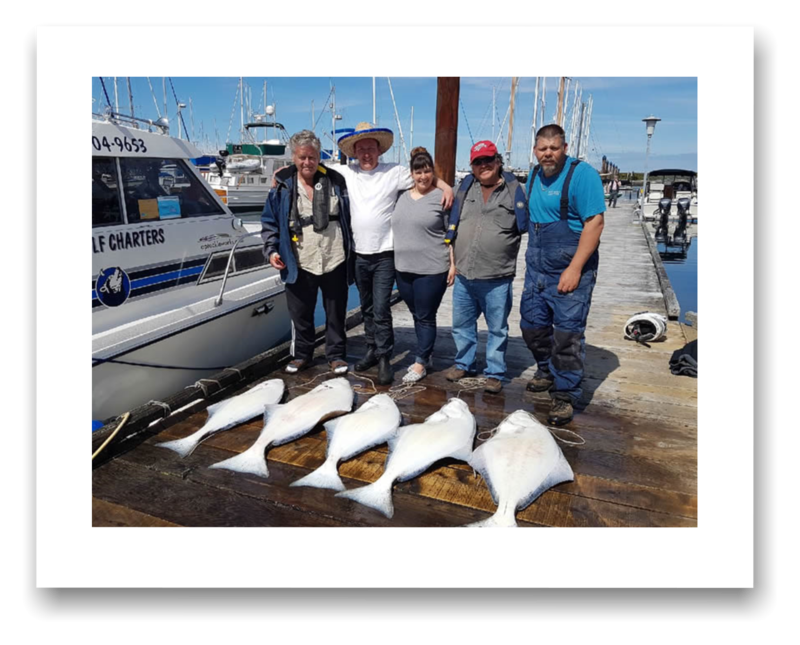 Most of the fishing effort around Sooke these days is focused on halibut. And there's lots of nice fish coming back to the dock. Here's Roy from Blue Wolf Charters with a boatload. His photos page says: "50, 48, 39, 35, 29 lbs. Halibut - Albert Head - DFennis, Ron, Neil, & Keely from Victoria BC, from Beacon Hill Petting Zoo 23rd year with Blue Wolf". Nice! Similarly, No Bananas Trevor braved some rough seas today to get this angler into a 40 lb halibut plus some spring salmon too. Trevor says "The new Gibbs Blue/Chrome Skinny g caught the salmon and a cut plug mackerel behind a small gibbs dodger for the halibut." So -- the fish are out there, just have to get on the water and chase them! Wishing you calm seas and tight lines.